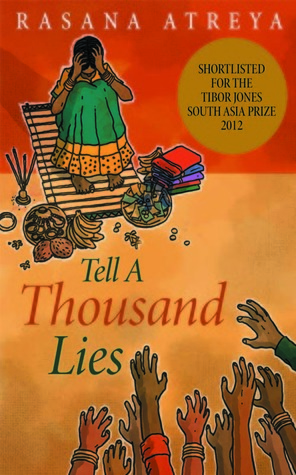 About a week ago, I received a Facebook message from Rasana Atreya, the author of Tell a Thousand Lies, asking me if I would review her novel. It was a first for me and I gladly accepted. This is Atreya’s debut novel and I thoroughly enjoyed reading it. The story is about a young girl in India named Pullamma who lives with her older sister, her twin sister, and widowed Grandmother. The family lives a meager existence in a small village. As the story opens, the grandmother, Ammamma, is arranging a marriage for her oldest granddaughter. As fate would have it, the bride viewing is interrupted by an occurrence which changes the course Pullamma’s life forever. What I really liked about this book is that the author did a wonderful job of writing it in a way which helped me to connect emotionally with the characters in the story. Every day, I could not wait to open my Kindle to continue reading the book. I also like the fact that I learned a great deal more about a culture I am only somewhat familiar with. Prior to reading this story, I was unaware that skin color made any difference in India. Truly, this story opened my eyes and I am grateful to have read it. Thank you Rasana for sharing your literary talent with me and the followers of Bookwinked! I will look forward to reading your future novels. This entry was posted in Uncategorized and tagged Books, India, marriage, Rasana Atreya, Tell a Thousand Lies. Bookmark the permalink.